Increase member engagement. What do you care about? Community, Advocacy, Professionalism? All of them? CLICK to begin the conversation. This is not a commitment but a conversation starter. This bill would decertify LCTA because our membership is below 50%. The bill moved quickly through the FL House and targets just teacher unions. Police, firefighters , and other first responders are excluded from the bill. Our union is the last line of defense against the privatization of public dollars. We can no longer be quiet. Talk to your colleagues, your family, and community connections. We must share our story if we are to preserve public education. What does HB 11 Mean? Click the image above to open and print the flyer. Click the image above to open and print the membership form. Building 4 goes away. A new building to take its place. 24 classrooms. If DOE denies one component of the plan, DOE denies the whole plan. 3 million to complete phase 1 has been set aside. Completed by the summer of 2018. Ball fields completed by fall of 2018-2019. 10 or 11 million has been set aside for phase 2. Should be completed by the beginning of 2019-2020. From phase 3 on, LCS is 15 million short. Capacity and need drive the project. If capacity drops, the need could change and limit progress. A discussion will need to take place on how to fund the rest of the project. DOE expects new construction to last 50 years. Lively and Adult Ed operated unregulated by LCS Finance/Budget Department in the past. Looking to hire teachers and not have them be hourly. DFC waivers and dual-enrollment are up. Capital Outlay dollars are not coming out of Lively and ACE budget though. Lively teachers at Rickards and Godby have their salary and benefits paid for by Lively. Rickards and Godby still get the FTE funding for the students. Programs cost a lot of money a the high schools. HR is working to recruit teachers to Leon County. There are low numbers for applicants for all positions. Nov. 16 – LCS interviewed 16 interns. Anything to simplify the process of becoming a teacher? Is there a large retirement of teachers coming up soon? Is there professional development that addresses cultural responsive teaching and classroom management? HOWEVER, these are usually more for teachers who DID NOT go through the college of ed. New Law: You can return to teaching as a retiree if you enter the investment retirement plan. LCTA Contract: Teachers who return will be placed at 20 YOE. More than half of the teachers that attended the 2015 TLA wanted to be administrators. Caroline Vastola (Conely Elementary) won a new TV provided by NTA Life! Donna George (Oak Ridge) won a new Kindle Fire HD provided by American Fidelity! Sue Shoemaker (Godby High) won a $25 Amazon gift card provided by American Income Life and 7 others walked away winners too! Join us at Capital Lanes. Even if you don't bowl, stop by and hang out with your fellow union members. As a result of LCTA's advocacy during bargaining, the first ESE meeting took place to share the work of our LCTA ESE Committee. The work to date shared the attached data and analysis. Click the button to view the document. Immediate areas of impact will include (1) ensuring resources during the next adoption of technology and textbooks account for ESE teachers and (2) informing site-administrators to serve as the during IEP meetings. Providing ESE teachers with IEP's a "concult" period instead of instruction. Developing a point system correlated to ESE matrices which would place limits on caseloads. Limiting the number of preps. Ensuring appropriate placement of students so K and 5 or behavioral and academic students are not in the same self-contained classes. The committee will meet again in January. If you are interested in being a part of the discussion , please contact LCTA . Attended Girls State: Interested in education. Interested in making education for all students. Best Practices Presentation (TABLED UNTIL JAN.) Not present. COCA’s mission is to serve and support the community by promoting and advocating for arts and culture in Florida’s capital region. GRANT PROGRAM: http://coca.tallahasseearts.org/services/grant-programs COCA administers grant programs on behalf of the City of Tallahassee and Leon County, distributing over $1 million annually to non-profit arts and cultural organizations that contribute significantly to the quality of life and tourism industry in Tallahassee and Leon County. Developed by a community task force, the grant guidelines are reviewed and revised every year. A diverse panel of community volunteers reviews applications and makes funding recommendations in a rigorous and highly accountable process. Stages will go live at different times. There will be phases. Cost: When you combine the cost of all the systems currently used, it’s less expensive. It is used by some teachers at Lively. Consider it one of the easiest systems to used. Messages can be sent by admin, school level, or profile specific. Example: Just teachers. There are three budgets out there. Presidents budget - zeros the budget. Senate budget - zeros the budget. House budget - fully funds it. IF THE PRESIDENT, SENATE, & HOUSE can’t figure the budget out THIS ALL GOES AWAY!!! LCS serves every school in Leon County. Private and charter schools need to meet the federal requirements to be eligible. TEC is at the school site and not a part of this. Suggestions: (1) Teacher planning day after Thanksgiving. (2) Finish school by Memorial Day. (3) Early release days on Wednesday. Teachers need more time to look at all the data. Or once a month. (4) Instead of 1/2 days, full planning days. More of them. (5) After MLK, there is a long stretch, so can we add Presidents’ Day. (6) Year-round school. (7) Trade 1/2 days for full planning days. (8) Change school start times? (9) Money is a driving factor so pay attention to the state budget. Examples of Alternative Placements: Second Chance, Success Academy, includes home school, etc. The Issue: A student would get a felony but then a student couldn’t have their rights restored to participate in activities. The adjudication takes a long time. The clock would start sooner for these students to participate in programs that would benefit them and keep them from getting in trouble. The FEA/LCTA 20 ESE Course s back! Do you need 20 hours for re-certification? SIGN UP NOW!! SPACE IS LIMITED!!! We are less than a week away from your chance to win a Kindle, gift cards, and more. To be registered for the raffle you need to see your LCTA Building Rep to fill out the Career Educator Program survey. Come to the Holiday Party this Friday, December 8 to enjoy a free drink (for the first 100 members between 7-8 PM, ) food, and fun! To sign up, click the button. ALL members - Be there from 7-8 PM for a FREE drink. 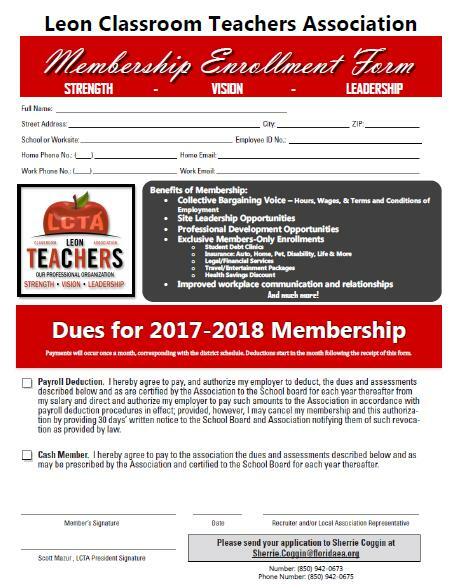 If you haven't seen your LCTA Board at school or you don't know where it is, contact your LCTA Building Rep to learn about the events, benefits, and work LCTA is doing in Leon County Schools. Employees of the City of Tallahassee Police Department, Tallahassee Fire Department and members of the Florida Sheriffs Association, and Tallahassee Professional Fire Fighters, Florida State Firefighters Association, North-Central Florida Police Benevolent Association have been carved out of the bill. Once they privatize and exhaust public school dollars belonging to taxpayers, who do you think they’ll privatize with little to no regulations next? The attack on #publicschools IS REAL! The attack on working families and a living wage IS REAL! The attack on a female dominated profession IS REAL! The attack by the super majority on your neighborhood schools IS REAL! FACT: Unions like LCTA who have less than 50% membership may lose their contract and collective bargaining rights. When the bill was first filed in 2011 it was never heard. Last year, it passed the FL House. This year with loss of members and influence of public education friendly legislators, LCTA and the other 58 out of 108 education unions in Florida may lose their rights guaranteed by their contract. This is because our union is the last barrier between profiteers and taxpayer dollars which fund your neighborhood public school. What is if you didn't have a contract? Your private and personal life could determine your employment. You get what the district wants to give you for compensation. Each year LCTA has been able to bargain more than the Districts first offer. You will not be guaranteed any planning or lunch time. There will be no standard work day. You could not get paid or paid less for supplemental activities. Professional duties will not be assigned in a fair and equitable manner. Employees will not have input into developing their teaching schedule. Employee participation in extracurricular activities after the workday for which compensation is not provided may be mandatory. Sign Up a Member Today! LCTA would be decertified under this bill. What is our course of action? To build a large, active and engaged membership. This bill presents an opportunity to have conversations with building reps, members and potential members about the worth of our union. We can build our membership, increase political engagement and develop more future leaders. All it would take is one new member per month at each school site. We can do this! To that end, I challenge each of us to talk to one co-worker about the value of LCTA and ask him or her to join. A membership form is attached, as well as talking points to use in your conversation. And, we are beginning a membership challenge. Everyone who brings a new member to LCTA will receive a $25 dues rebate. Extra cash will come in handy during the holiday season! You may have seen media reports about teachers in Hillsborough County and their struggle to hold the district to their contracted $4,000 raise, promised in 2013. This past week Hillsborough teachers "worked the contract," which means they did not work past contracted hours. Think about it--we all do it. Many of us probably don't think twice about it. One Hillsborough teacher, Joseph Cool, had this to say: This isn't about trying to hurt students, and is only a short term action to show the district how much we do. We are trying to make things better in the long term for teachers and students alike. Please support your teachers this week while they take a stand. Read more about the union's work in Hillsborough here, and let's support our brothers and sisters in Hillsborough by wearing blue on Tuesday. Post your pictures on social media with the hashtags #publicschoolproud, #unionstrong, and #hillsyeah. If you're on Facebook, you can also add a frame to your profile picture in support of HCTA. Every January, our region sponsors a leadership conference to help members develop new skills and network with colleagues. This year, the conference is January 12-13 in Panama City Beach. The Gulf Coast Leadership Conference is affordable and robust: The $50 registration fee (covered by LCTA) includes the Friday evening reception, breakfast and lunch on Saturday, coffee, drinks, snacks and training materials. A general session Friday evening kicks off the activities, followed by breakout sessions and a reception. Dinner Friday night is “on your own.” Following breakfast on Saturday, you will choose three 75-minute training sessions and attend a late lunch/closing session. Session descriptions are attached. If you want to check out the hotel, it's at the Sheraton Bay Point (LCTA will also cover hotel expenses Friday night, double occupancy). If you'd like to stay the rest of the holiday weekend, you can pay the Sheraton extend the room rate of $109. Registration deadline is December 11, so let me know! I hope you all had a wonderful break with family and friends. Watching our children interact with their grandparents, laughing and playing board games, and all the other festive traditions we have, remind me of how fortunate and thankful I am for the family, friends, and union we have. It is all about relationships and the time we get to spend together enjoying the things that truly matter in life. Therefore with all the holiday craze and data point expectations to come, please join LCTA and me in keeping things simple and focused on what counts the most, our kids. Don't hear about it. Be a part of the celebration! Ask someone to join LCTA. Fill out your NEA/FEA/LCTA survey card to enter the drawing for a Kindle, gift cards, and more! Get members from your site to make a team. High score will win the LCTA bowling trophy. Article 25.05 School Improvement Central Council. A School Improvement Central Council shall be established to coordinate all school improvement efforts in the District and to assist schools with training or other support for shared decision making. This Council shall be comprised of twelve (12) members, fifty (50) percent appointed by the LCTA President and fifty (50) percent appointed by the Superintendent by August 15 of each school year. Two (2) members must be from the business community, one appointed by the LCTA President and one by the Superintendent. Additional participants, as needed, may be appointed by the Council for service on special committees, maintaining the same 50-50 basis. The Council will have co-chairpersons, one appointed by the LCTA President and one appointed by the Superintendent. The attainment of consensus among all members of the Central Council shall be a primary goal. Decisions will be made by three-fourths vote of those members present and voting at the meeting if consensus cannot otherwise be reached. Roberts Rules of Order shall be applicable to all procedural issues not addressed herein. An agenda shall be prepared by the co-chairs of the Council and distributed at least five (5) working days prior to each Council meeting. Develop and maintain a variety of training models for shared decision making and school improvement. Review and provide feedback regarding school improvement plans, school reports, and SAC membership to the Superintendent and School Board. Share school improvement and shared decision-making information with sites and with the public. Review and make recommendations on waiver requests to the Superintendent, employee organizations, and/or the School Board. Provide technical assistance to schools as requested. This training gives general education teachers useful information, strategies, and tools to design quality learning experiences for the exceptional needs students (ESE) in their classrooms. The training also includes information to assist their work with colleagues and parents who support students with disabilities. If you have questions feel free to contact Kim Newman and Katie Fritz by email at newmank@leonschools.net and fritzk@leonschools.net . Although the course has not been posted yet, be on the look out at Performance Matters (TNL)- PD Registration & Evaluation. Every January, our region sponsors a leadership conference to help members develop new skills and network with colleagues. This year, the conference is January 12-13 in Panama City Beach. Want to attend? Keep reading for more information. Shout out to the LCTA Building Representatives from Raa Middle School, Godby High School, Success Academy, Second Chance for sharing an email with their staff about the holiday party and bowling night. Kudos to Raa, Godby, and Roberts for posting and sharing a picture of your LCTA board at school too! Be on the look out for information from your rep! The events are here! The time to sign up is now! Click below. Subscribe to receive the Frontline Report during session. Legislators create laws that govern everything teachers do on the job. Floridians must begin to hold lawmakers accountable. Our students are the state's most valuable asset. We must get this right, immediately, but you must stay informed and get involved. HB 621 by Rep. Renner (R-Palm Coast) Similar to legislation filed a few years ago, this bill would allow the carry of a concealed weapon or firearm on a public school campus by a designated school employee or volunteer, current or retired military personnel, current or retired law enforcement officer, or a person who has a concealed carry permit, if they are approved and authorized to do so by the school principal or superintendent. "The worst things we do as educators is we are too nice. We are too nice!" Nationals on the Move - NEA, AFT, & AFL-CIO advocate for teachers and the middle-class! This is why we are a part of our state and national affiliates! It isn't about being a R, D, L, I or any other political party. It's about what is best for our kids and those who serve them. #4 The GOP tax bill would increase taxes on many middle-class families, and most of its tax breaks would go to the top 1%. According to independent analysis of the previous version of the GOP tax plan, 30% of households making between $50,000 and $150,000 would pay more in taxes, while the richest 1% would walk away with 80% of the tax breaks. Republicans have made some adjustments to their tax bill, but it still is heavily weighted toward the top. Our UNION is about protecting the foundation of equality in our country, public education. LCTA Proposed (and TERC will vote in January) to set deadlines for the entry of observation data on Performance Matters (formerly known as True North Logic) by administrators. Just as the relevancy of feedback diminishes over time for our students, the same happens with observations. Timely feedback is necessary for development. For continuity and ensuring all teachers hear the same message, two videos made and shared with all instructional staff. Roster verification for the spring. Any teacher testing a state assessed test should verify their class rosters on a computer. DO NOT do roster verification for state testing on paper. LCTA requested teachers receive data aligned to their roster verification as well as all students in their class. If SLO's are only for matched and qualified students, teachers should receive data including ONLY matched and qualified students. LCTA and LCS agreed there should be no surprises about teachers reappointment. LCTA and LCS agreed the intent of the process is not to collect data to non-reappoint a teacher. The only individual that should be doing evaluative should be administrator. No content coaches, deans, teachers, or outside observers practice evaluations should be used by administrators. LCTA suggested non evaluative walk through be used more effectively to identify issues that need to be addressed without entering an evaluation score. LCTA stressed the evaluation process must foster trust for professional development to take place. Some administrators only visit classrooms when they are evaluating teacher which results in a high-stakes environment. LCS said Principals do not have to rate the teacher in an given element even if it is observed. Feedback can be given without scores. Student and staff moral surveys will be reviewed at the end of the year. During the second semester, LCTA proposed a professional development with teachers and admin to engage in a conversation about the teacher evaluation process. If you're interested in being a part of this conversation, email LCTA. Stay tuned! The dates for the second semester training will be announced soon. DON'T FORGET: Visit the benefits page. LCTA has some exciting things planned for December. Mark your calendars now and attend your LCTA Building Rep 10 Minute Meeting before the Thanksgiving break. We've all worked hard, now it's time to play hard and enjoy fellowship, food, and fun. Administrations must provide equitable teaching loads to employees teaching the same courses. These assignments must be assigned in a fair and equitable manner. LCTA is aware there is a practice of placing all the retained students into one class at some school sites. For one site there were 10 retained students in one class of 17 students while none of the other classes. This is by definition not a fair and equitable. LCTA has filed a grievance on behalf of the teacher at the school site and one with the district to ensure practices in LCS are consistent with contract language. LCTA will keep you updated on the process of the grievance. 7.01. A. 1 Employee Assignments. General. All professional duties shall be assigned to employees in a fair and equitable manner. 8.01 Class Size and Class Load. Class size shall not be used as a punitive measure against an employee. Within a given site, the administration shall provide equitable teaching loads to employees teaching identical courses, consistent with considerations of scheduling, curriculum, teacher concerns and preferences, student needs and preferences, and physical space constraints. Many schools are dealing with or have dealt with school recognition votes. Here is the state statute and some additional information from FLDOE to help you better understand the requirements. NOTE: The funds can all go towards staff bonuses. Temporary personnel for the school to assist in maintaining and improving student performance. How may the funds from this program be used? Funds are to be used for nonrecurring bonuses to the faculty and staff, nonrecurring expenditures for educational equipment or materials, or for temporary personnel to assist the school in maintaining or improving student performance (Section 1008.36(5), F.S.). The school's staff and SAC must decide to spend these funds on one or any combination of these three purposes. If the school's staff and SAC decide to give bonuses, they determine who is to receive them and how much each person will receive. The decision on the use of funds must not conflict with any district or state policies on expenditure of funds. Since social media began, FEA has advised members about their online presence.. Most recently, FEA issued a 10-minute meeting on why we should not text students, also attached. Below you will find the files of the FEA handouts and the LCSB policy discouraging you from engaging students in social media. LCSB Instructional Staff Policy = 3213 - STUDENT SUPERVISION AND WELFARE: I) Instructional staff members are discouraged from engaging students in social media and online networking media and are expressly prohibited from posting any video or comment pertaining to any student on social network sites or similar forums, such as YouTube, without the express permission of the parent. Check out the calendar for what's coming up!